At the start of 2012, we adopted some ‘principles’ – a rather grand name for a list of things we were trying to do and how. It’s somewhat past time to have look back to see where we are and whether we’ve stuck to these or think they should be altered. By ‘moderate size’ we meant museums which don’t have there own IT teams or large budgets (average app apparently costs ~£30,000) for software development, but which do have some effort – whether staff or volunteer – to put into creating some mobile device-based museum experiences. By ‘mobile devices’ we meant those that are now consumer, high-street, web-enabled devices (iPads and similar tablets and smartphones). It was pointed out that other, more specialised, mobile devices (such as Voca) might be included, but we have not done that specifically. We have tested several things in and around two ‘moderate sized’ museums: the Museum of English Rural Life and latterly, the Ure Museum of Greek Archaeology. 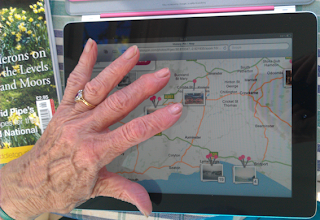 almost everything we have done is driven through the web so could be accessed using visitors’ own phones/tablets. BUT we have done almost no design specifically for visitors’ phones and, while some logs show visitors’ using their own phones in the MERL, there has not been any sustained info available about how to connect to the in-gallery wi-fi or any handouts on what is available. Much of what we’ve tried has been on our iPads loaned to visitors during special events (such as half-term family activities). We have found that more minor involvement, simply being ‘in charge’ of an iPad with it hung around your neck, or being able to change a trail in a small way by selecting the relevant objects from a set for the Olympics trail did increase engagement, and led to greater interaction within groups. The novelty of simply ‘scanning’ a QR code, getting an iPad to ‘beep’ and finding another clue had a hugely engaging effect on 2-82 year olds, with great excitement and chatter from all abilities. Whether that indicates any engagement with the actual objects…. We have iterated quite a bit on the symbol/QR code/label combinations – cutting down the use of more ‘abstract’ symbols considerably. BUT where does this leave iMuse? It needs to find a way to encourage museums to become ‘mobile device’ friendly. Trying fun things out in a couple of museums does not lead to anything sustainable. We are looking for ways to encourage others to try things, for example by setting up an advisory service in partnership with other organisations. We’ve found that some people can have difficulty making touchscreens work. There can also be problems with lining-up the camera on a smartphone or iPad with a QRcode. A previous blog, http://imusenews.blogspot.co.uk/2012/02/initial-experiences-with-touch-screens.html, described these problems. We have a bit more experience, from both visitors and volunteers/staff at our iMuse partner museum and from more elderly and partially-sighted (potential) users elsewhere. First, on the touchscreen, it seems some people just do not have whatever the right ‘chemistry’ or whatever is needed on their fingertips to get a screen to react. 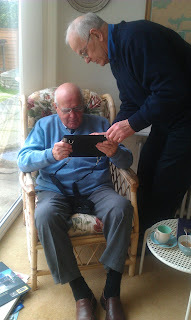 Here is a 92 year old, who can see well enough to touch an icon on an iPad 2, and who is proficient with similar manual tasks such as typing. Despite help, the iPad just did not react at all to his touch. Interestingly, an attempt on a subsequent visit, this time with the new iPad, presented no problems at all and touching, swiping and pinching were all fine. A staff member at the museum described a similar touch problem with an iPhone, which would not react at all. However, trying our new iPad was fine. Now, they had just come from a shopping trip during which they’d tried out some hand creams. Pure speculation, but is there a connection? One of our volunteers (who wishes to remain anonymous due to this unsavoury habit) confesses to licking her fingers before using a screen that isn’t reacting (and sometimes feels this helps also on a laptop tablet-mouse). Is this real or the start of a new urban myth? What about the weather? Is a very dry day unhelpful? A museum volunteer just could not get a ‘touch’ on the iPad to work but there could be a reaction to movement – the whole screen in an application shifting. This can be disturbing for people not used to it – they can even think they have ‘broken’ something. We have had this ‘fear’ reaction also from someone in their 70s who is a long standing computer-user, but used to the more mechanical ‘feel’ and reaction of a keyboard and mouse-click. Earlier, we found another 92-year old felt reasonably comfortable with trying out Historypin (which involves touching a map) on an iPad 2, saying she ‘would enjoy doing this’, but again there could be unexpected movement as the user leaves their finger on the screen, or inadvertently touches it, for example while passing the iPad to a companion. For now, we are locking the screen in the trial ‘apps’ but this isn’t ideal as some of the usefulness of the iPad (e.g. pinching to increase the size of photos to see more detail of a museum object, or as an aid to those with failing sight) is lost. The iPad can also be awkward, and rather heavy for someone with weak wrists to hold. Without any sort of extra case it can feel a bit hard and ‘slippery’. We also found during the Project Berkshire experience in the shopping mall that some people preferred to use the iPad mounted in a box to do the drawing activity, somehow maybe it felt more ‘secure’? For its use as a QRcode reader, mounted for example on our trolley for a museum visitor to wheel around (http://imusenews.blogspot.co.uk/2012/02/great-reading-cheese-mystery-part-4.html) we have been thinking of moving from the amateur-looking sticky tape and cardboard box to a custom-built wooden box [as befits a Rural Life museum]. This would however increase the weight which may not help more frail users when using it say at home. This is a consideration for our new project, using the iPad and music, where the iPad will be used in partially or totally ‘uncontrolled’ environments in a care home or in the user’s own home. Perhaps again, using it on an adjustable trolley/table rather than handheld might be the way forward? It would give the user one less thing to worry about. Have other projects had experience with this elsewhere? 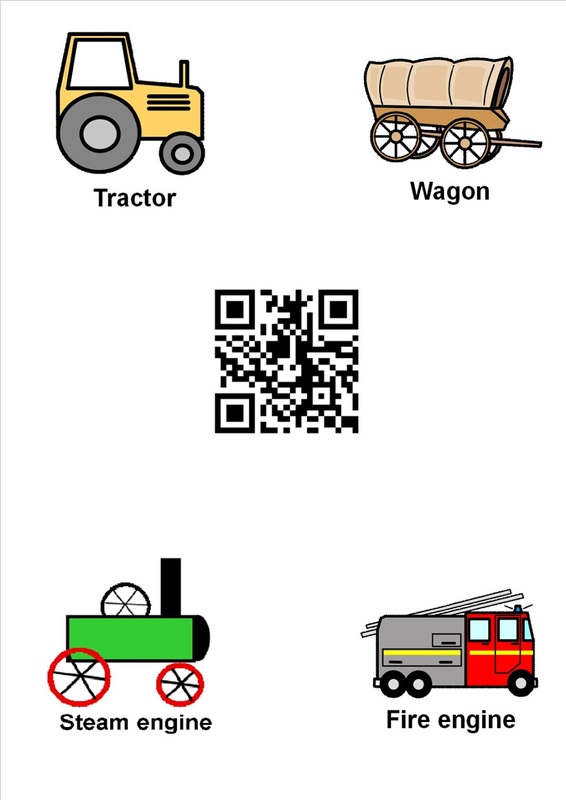 Using the iPad in a box with QRcodes on movable labels has proved extremely reliable for all visitors to our mini trails. In fact, children enjoyed having to control sliding the label under the camera until the iPad ‘beeped’ and put them online. However, for a partially-sighted user who tried out the box, this lining-up proved a bit problematic, and we have not yet had any user with more difficulties with hand-control try it. Our idea at the moment is to use reasonably thick card for the labels, to give stiffness, and to provide some sort of raised guide rails to help line up the label as it is slid into the box. We’ll do some further testing with users and report back! What’s imuse trying to achieve? Part 1 is at http://www.aact.org.uk/imuse.php. Here’s some more thoughts. We picked up interesting ideas from Museum Computer Network conference, Atlanta, November 2011 especially from Nettrice’s workshop on Alternate Reality Games – ways of encouraging visitors and museum interaction. Some of those methods were used in the mini [cheese and cheesey] ARG at half-term. That sums up (rather more succinctly than in http://www.aact.org.uk/imuse.php) what imuse is trying to enable. OK, we are working within some definite constraints. imuse is a project being run by a tiny charity – we are not ourselves a museum. The Charity’s aim is to find ways that inclusion can be increased for those with communications disabilities using IT [our Charity’s strapline is ‘IT helping inclusion’]. imuse is exploring systems that enable ‘interactivity, curiosity, challenge, cooperation, choice, creativity, discovery, failure [well, and success! ]’ in the context of: small and moderate sized museums that don’t have dedicated IT teams or much (if any) spare cash for trying new things or buying equipment. Our plan (to 1Q13) is to try out ideas in ‘several’ (currently defined as ‘three’) museums. If things look promising (i.e inclusion increased) we aim to explore the possibility for setting up a sustainable advisory service. We are an ‘infrastructure’ project. That is, we look at how museums and their visitors can put in place systems which aid inclusion, particularly using IT. It is then up to the museums and visitors how they use those systems towards their own aims. Taking the analogy for physical access, a consultant may advise a museum on where to put lifts, toilets, the height of the reception desk, space around objects. The consultant will have done a good job if more people can get into and move around the museum. Why the visitor wants to do this and why the museum wants them to do it are different matters, will change over time way after the consultant has gone and will have many facets. For example, one visitor may want to bring her grandchildren somewhere fun for a holiday outing where they can do things together, another may want to study a specific museum collection. The museum may have funding to help local schools with part of the national curriculum, or have an aim to increase volunteering. The access consultant may have been apprised of some of these at the start of his project, but cannot know them all because things change. Those outcomes are not his speciality. Getting people in and moving around is. After that it’s up to visitors and the museum whether they use the systems for having fun, running a cocktail reception, formal learning, somewhere to go on a wet Sunday. We’ve tried a very simple ‘game’ in which an object had an A4-sized label attached looking like this. The child is asked to find one of the labels in the museum, a volunteer scans the QR code with an iPad 2 and the child is asked to ‘touch’ whichever object they think they are looking at. The reasons for doing this, including the use of Widgit symbols for objects can be left till later. For now this is a note to remind us of the practical problems and what we’ve done since. The ‘game’ was trialled with some under 5s (plus mothers) and also shown to some museum volunteers, a few other visitors and staff. Problems included: small fingers not ‘touching’ enough, ‘dry(? )’ fingers just not getting a response, elderly visitor with gloves on (did not feel could ask to remove), a vague ‘fear’ of touching the screen, response time not completely instant (child used to iPad apps). There were problems in some areas of the museum with variable wi-fi (appearing sometimes on one moment, off the next). Lining up the iPad (which was hung round the neck) with the code caused some uncertainty on occasion (possibly the non-central positioning of the camera on the iPad causes problems in alignment that don’t occur with a smartphone). Shadows occasionally caused a problem. A4 sheets were hung with string from the objects. It was not always possible to get them so they didn’t move/swing round or so that they were at a good height, though some of these problems were due to their temporary, experimental unplanned nature. For our half-term activity (The Great Reading Cheese Mystery qv) we wanted a totally reliable way of children being able to get an iPad to ‘decode’ a clue which included a QR code. We therefore set up an iPad in a makeshift box, on a table with good wi-fi access. The children find a ‘clue’ and return to the ‘lab’ to have it analysed by the decoding ‘machine’. So far the i-nigma QR code reader app has been found reliable and this was loaded. The iPad was set not to turn off to minimise things that ‘could go wrong’ though the i-nigma app would need ‘resuming’ if not used for some time. The child slid the clue under the iPad in a slit in the box. The iPad then revealed the analysed ‘clue’ (a simple wepage). Apart from one very brief spell lasting a minute or so (in which i-nigma reported server problems) the decoding has been fast enough and totally reliable over two days. On the whole, children quickly learn how to position the code to get the app to ‘beep’ that it had read it. Some easily learned how to go to ‘home’ and restart i-nigma. Children seemed to enjoy using ‘the machine’. The ‘machine’ was movable so a child in a low wheelchair was able to use it and read the resulting clue. Children down to around 4 years old took part successfully. The machine was ‘manned’ by volunteers throughout. Of course, we would like to have much more mobile access around the museum. The iPad has some proven advantages for people with various types of communication and related disability, using the inbuilt Accessibility features. However, its weight, the problems of reliably touching, wi-fi difficulties and problems of aligning with QR codes mounted in the ‘traditional’ museum position (e.g. on an existing label), not to mention security issues, have put us off using it in this ‘conventional’ way. One of our next steps will be to trial a lightweight but stable trolley which small groups can take round the museum, picking up QR codes on cards and ‘feeding’ them to the machine rather than the other way round. We will need to chose objects for their good wi-fi coverage and physical accessibility as well as for their interest/relevance to the trail or game. We hope this way to enable visitors who find difficulty in typing (e.g. to put in an object’s stop number) or reliably using a touch screen to participate in a trail and to take part in choosing what they find out about. The RSA has given a grant of £1,500 from its Catalyst Fund to Fellow Annette Haworth. Annette is imuse’s voluntary Project Manager. She will put £900 of her grant towards the cost of engaging a museum learning professional who will help create material especially for people with communication and learning disabilities. £500 of the grant will be used towards evaluation by a specialist in digital access for people with communication and learning disabilities. The aim is to help find real, practical evidence for the impact of the imuse ideas. If the results are as encouraging as we hope,this evidence will be used to encourage funders to help us set up a national advisory service mid-2013. This would help smaller museums, who cannot afford to have such expertise in-house, engage visitors in novel ways using IT. You can see the bid to the RSA here.